BALTIMORE – Nothing much happening in the stock market yesterday. So, we take this occasion to turn back to the seamy side of life… to the grit and tumble… to the dog eat dog… and red in tooth and claw world of U.S. presidential politics. But uncharacteristically, we rise not to talk smack about the candidates but to defend them. Yes, we always take the part of underdogs, diehards, and lost causes. And today, we take the part of Trump, Sanders, and Cruz – against their critics and calumniers. A stopped clock, they say (too often referring to your editor), is right twice a day. Candidates for the highest office in the United States are right less often. Still, occasionally – whether by accident or insight, we don’t know – they have a good idea. And today, we congratulate them for it. First up, Donald J. Trump. Most of his ideas are incredibly bad. Example: He and his arch-rival, Hillary Clinton, were in the news yesterday for criticizing the maker of Oreos for moving the plant where the iconic cookies are made to Mexico. Neither seemed interested in why the cookie maker was leaving. They were too busy shamelessly pandering to people worried about losing their jobs. They are not for “free trade,” they say. They are for “fair trade.” But the only “fair” trade is free trade. “Fair” can be whatever you want it to be. Which is why “fair trade” restrictions are nothing more than disguised payoffs to cronies and special interests. If they had bothered to look at why the Oreos were rolling south, they would have seen the entire confectionary industry is fleeing along with them. Because the feds put up the price of their main ingredient – sugar – to two to three times the world price. Because they are “protecting” a handful of millionaire crony sugar growers who give big contributions to the politicians. But let’s not get caught up in The Donald’s bad proposals. Our destination today is one of his good ones: He wants to pull out of NATO. The entire MBA-ed, bonused-up, chardonnay-sipping Establishment gasped. But it’s a good idea. And pull out of the U.N. while you’re at it. And every other blood-sucking alliance, NGO, and institution – especially the World Bank and the IMF. These groups take money from honest workers and use it on high salaries, conferences, first-class airline tickets, and dead-end programs. Good on you, Donald, for proposing to cut them off. We also read Bernie Sanders’ written speech (he was the major candidate who dared not to appear in person) to the powerful pro-Israel lobby group the American Israel Public Affairs Council (AIPAC). Perhaps, as the only Jewish candidate and surely the only one to live in a kibbutz, Bernie thought he could get away with snubbing the group. But to be successful, we have also got to be a friend not only to Israel but to the Palestinian people, where in Gaza, unemployment today is 44%, and we have there a poverty rate which is almost as high. The other candidates – including Trump and Hillary – told AIPAC what it wanted to hear. But not Sanders. He used the speech to call on Israel to end “disproportionate responses” to attacks… specifically the “Israeli counter-attacks that killed nearly 1,500 civilians and wounded thousands more” in 2014. The conservative Breitbart News Network – with offices in London, Texas, California, and Jerusalem – was quick to condemn the “five outrages” it found in Bernie’s speech. Practically every other candidate and opinion maker saw the speech as more evidence that Bernie was unfit to be president. We didn’t care for it much, either. That was okay for Washington and Jefferson… “Avoid foreign entanglements,” warned Washington. Bernie came close. But neutrality would be asking too much of any real U.S. politician today. The U.S. is an empire. Everyone knows it. No sparrow can fall from a tree anywhere on any of the seven continents without setting off an alarm in Washington. Still, it’s a delight to see a candidate for president using a speech to one of the largest sources of financing to say critical things about the organization in front of him. As far as we know, no candidate made a speech to the American Task Force on Palestine, which lobbies for an independent Palestinian state. And now, on to our third, and most sincere, act of appreciation. 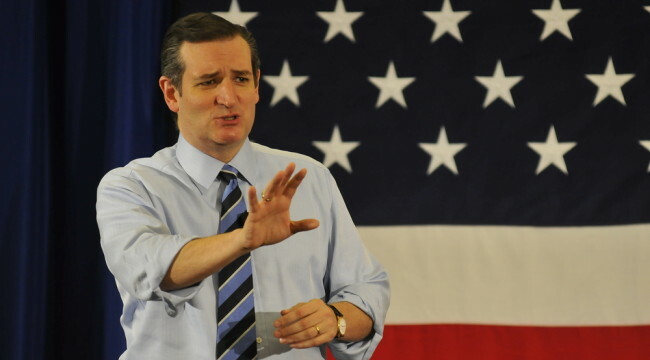 Believe it or not, Ted Cruz has made a “return to the gold standard” campaign promise. The Establishment – great and good as it is – can live without NATO. It can survive without Israel, for that matter. But the gold standard would be a stake driven right through its black heart. The whole world’s financial system is built on a corrupt dollar. Gold-backed money is very different. It has real value. Because you can’t increase the quantity of gold at will. And you can’t provide unlimited phony credit to the world economy. Somebody’s got to earn… and save… every dollar you lend out. So, you can’t artificially jack up Japan’s economy in the 1980s… or China’s economy in the 1990s and 2000s. In a sound economy, each dollar represents real resources… real savings… real wealth… that has been set aside so it can be invested to create more wealth. At least, that’s the way the way it is supposed to work. But that’s not the way it does work. And the Deep State… the cronies… the zombies… governments, NGOs… Wall Street, and big business – all depend on this credit-based, corrupt dollar system. Bravo to Ted Cruz for proposing to end it. Like the other good ideas from Trump and Sanders, there is little chance it will be implemented any time soon. Still, we are grateful to Mr. Cruz for bringing it up.